How many core, elective and specialization subjects are there in Marketing? What are the eligibility criteria for two year full time PGDM Programme? We expect candidates to have 50% throughout their academic career. We also look at scores from CAT/MAT/XAT/ATMA/CMAT/GMAT and assess the overall candidacy of the applicant from their MBA readiness perspective. What are the eligibility criteria for NRI students? What are candidate assessed for during the admission process? We welcome students from diverse academic, professional and personal backgrounds and examine all components of their application to gain an insight and understanding of them as candidates. We assess the overall candidacy of the applicant from their MBA readiness perspective including personal competencies such as communication and interpersonal skills, teamwork and leadership qualities. We appraise the candidate from an overall perspective as we assign greater weightage to the overall candidacy of the student (vis-a-vis the competencies of willingness to learn, market orientation with demonstrated aptitude & PI). How can one apply for FIIB? 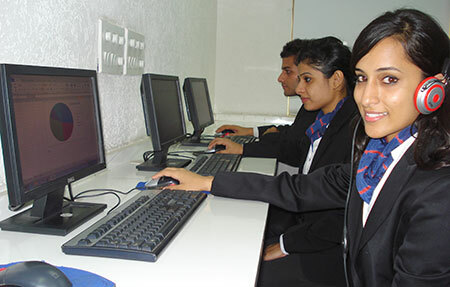 You can apply online from Institute’s website www.fiib.edu.in or use http://fiib.edu.in/mba-pgdm-programs/admission/instruction.php and make online payment of Rs 1,200 along with the duly filled form. Do I need to carry my original documents for verification on day of Personal Interview? No, you need not carry your original documents on the personal interview day. However, you need to get your original documents verified on your Orientation Day. We process applications as they are received. The declaration of results is usually within 5 days of the date of appearing for an Aptitude Session/PI with FIIB faculty. What consideration is given to work experience? Work experience adds value to the applicant portfolio and is considered in the overall evaluation of the applicant file. Candidates with professional experience have a better chance for admission. Due weightage is given to the work experience gained by the candidate. Does FIIB hold off-campus interviews? In which all cities and what are the dates? Yes, we do hold off-campus interviews in cities like Kolkata, Lucknow, Kanpur, Allahabad, Varanasi, Chandigarh, Jaipur, Bhubaneshwar etc. and this also depends on the number of applications received from a particular city or nearby location. About the exact date and time, it will be intimated to you through e-mail and also over telephone. When would be the final selection letter issued? The selection letter will be sent to you through courier and also through email. A phone call will be made to you informing you about the same. Which all entrance exams does this institute take? We consider scores from entrance examinations namely CAT/MAT/XAT/CMAT/GMAT/ATMA. What is the complete selection procedure? Step I – Applying for Application form through website. Step III – Shortlisting of candidates for aptitude and Personal Interview session. Step IV – Inviting candidates for Personal Interview on the given date. Step VII – Ist Instalment (INR 75000) of Tuition fees to be paid within 10 days of result declaration. What is allocation of Weightage? What was the highest package last year? Can you highlight a few typical profiles that were recruited from Campus last year. How many interviews can a student appear for during placements? The guidelines for interviews are governed through placement policy which is revised every academic year by the institute. Currently student is allowed to opt for as many interviews till he gets selected / hired for a desired job preferable in the area of specialisation. What is the Placement track-record for the Institute? Please share the names of some of the Live Projects done by the students of the Current Batch. What all would be the placement & career options after HR Specialization? India currently boasts of a booming recruitment process outsourcing industry. Candidates with good communication abilities combined with people skills are in great demand in this industry as well as the larger consulting industry. Candidates who are capable of handling sensitive human issues with a balance of rationale and logic are preferred by domestic and multi-national companies for In-house HR processes. Employee relations is another area where skilled managers are in demand. FIIB has been able to attract all such positions across companies of all sizes. Our alumni are performing creditably in these organizations. Some of our happy recruiters are Stellar search, ABC consultants, TCG-Hamilton and Shoppers Stop among many others. Please provide some insight on scholarship scheme of the Institute. FIIB offers 2 different scholarships to deserving candidates. The first scholarship upto Rs.1,70,000/- is based on their academic records which includes (Past academic performance, Score in competitive exam, relevant work experience). And the second one is based on academic performance of the students at FIIB. At the end of the 1st year, the top 10 Students of the class receives a scholarship. The top 3 students receive Rs. 1 Lac each and the balance students (in the top 10) receive Rs. 50,000 each. Can you please tell me what all is covered in the fees? Does it include Laptops (configuration)? Suits? Abroad trips? Hostel? The total fee for the course is Rs. 7.50 Lac (which includes all Tuition fees, Study Abroad Program, Study material, Lab fees, and Library charges). The basic fee includes all certificate programs that are offered in the 2 year program. These include soft skills certificates and other professional certifications. A laptop is a must for all entering students. Our IT department can help in purchasing laptops with students using FIIB discount schemes (we can provide an IT handout for interested students). Hostel charges are additional. Are there any extra fees for the international tour? The International business study tours are an integral part of the FIIB PGDM experience and hence, all travel expenses (accommodation, food, tickets for travel, industry visits) are included in the fees. Each student has to pay for their visa and insurance charges. Last year these were estimated at Rs. 5000/- per student. Any discounts offered to people from Army background? We do not offer any discounts on our fees. Would the institute assist me in getting my programme financed from Bank? Yes, the registration fee is refundable as per AICTE Norms. What are the rules for refund of fee in case of cancellation of admission? When the request is made before the date of start of the academic session and the institute could fill the seat before the cutoff date from the waitlisted candidates. Entire fee should be refunded including full amount of security deposit, caution money if the request is made before start of academic session. A deduction of Rs.1000/- towards processing charges will be made by the B-school. When the request is received on/after the beginning of academic session and the institute could fill the seat before the cutoff date from the waitlisted candidates. Entire fee less the Seat Cancellation Charges on pro rata basis. For calculation of pro-rata basis, 1 month shall be treated as 1 unit. For example if the candidate withdraws within a month after the start of academic session and the seat is filled before the cutoff date, the cancellation charges on pro rata basis will be the amount of total fee/12 or Rs.1000/-, whichever is higher. What is the dress code for students in campus? The dress code is a mix of smart casuals on most days to formals for specific events such as business leader lectures, project presentations, placement interviews, etc. What all extracurricular activities happen at Campus? 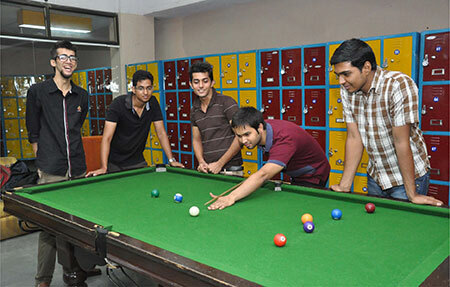 Various student- driven clubs at FIIB cover all the professional and administrative activities. Students are free to choose any club as per their interest and hone their managerial skills while they undertake different leadership roles to organize the events. 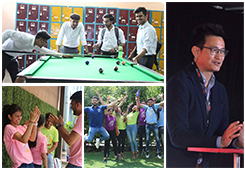 We have various clubs like Finance Club, Marketing Club, Dramatic Club, Cultural Club, Sports Club, Alumni Club and Corporate Interaction Club etc., to help students develop their interests and expand their horizons in various sectors. We also run sustainability drives to stand for social causes, in association with leading partners (like Chintan, Goonj, Green Bandhu) in this field. An inter-college Management and Cultural fest is also organised at FIIB, annually. Do we have sports meet annually? At FIIB, sports is considered as an integral part of the growth of students and hence we have the annual sports meet under the name of Ranbhoomi with a variety of indoor games like Table tennis, Chess, Pool table ,Carrom etc. 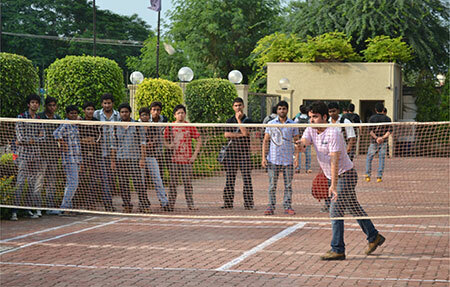 and Outdoor games like-Cricket, Volleyball and Badminton. We have a tie-up with the University of Arkansas, University of Tampere, ICPE and INPAQT. Selected students from these universities visit our campus. Student from FIIB are also offered to visit/study at our partner institutions. FIIB has a ‘Zero tolerance’ policy on ragging, and anybody found guilty will be punished appropriately. Similarly, we have a 'Sexual Harassment policy' too. The FIIB campus is a state-of-the-art building offering spaces for recreation, sports, reading and browsing. 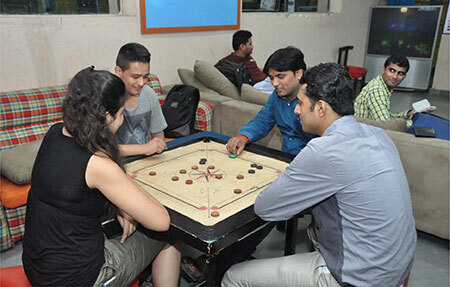 We have all major indoor sports (including pool, carom and chess); a fully Wi-Fi campus, student lounge with theatre-style TV, a cafeteria serving scrumptious meals and beverages. Team rooms/syndicate rooms, language labs, library housing over 17,500 books, auditorium with provisions for video conferencing along with other modern technologies and many other facilities are also provided. Can you give some information about the faculty profiles at FIIB? Like experience-corporate or teaching etc. Our faculty comprises of award-winning individuals from renowned institutions such as IIM, FMS and IITs with extensive industry experience with companies like KPMG, Deloitte Consulting, HDFC Bank and many others. We also invite faculty from leading B-schools and major corporate houses to teach full courses and. Guest lectures are also held by experienced professionals and visiting faculty, at FIIB. How much experience does the faculty have? The average teaching experience of our faculty is 10-12 years. What is the cut-off for entrance? We prefer 50% in graduation as per AICTE, and a score from CAT/MAT/XAT/ ATMA/CMAT/GMAT. Our 2019 cut-off for CAT and MAT is 50 percentile. However, we appraise the candidate from an overall perspective. We now assign greater weightage to the overall candidacy of the student (vis-a-vis the competencies of willingness to learn, market orientation with demonstrated aptitude and PI). When is the new session going to begin? Our session will commence from early June 2019. How many branches do you have in India? 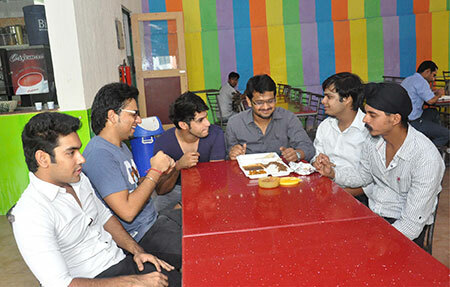 We have only 1 campus which is in South Delhi at Vasant Vihar. How many seats are there and how many students are there in a class? We have strength of 180 (AICTE approved) students. Each core class (1st year) has up to 60 students. The elective classes in the 2nd year could have as low as 20 students, depending on the course. What are my specialization options at FIIB? ? The specialization option includes Marketing, Finance, Human Resource Management, Strategy & Entrepreneurship, Operations Management, Business Analytics and International Business. The coursework is designed so as to allow students to either specialize in 2 areas or major in one area and take courses from other areas as per their interest. Note, all courses include a very strong global component. Through live projects, case studies, lectures by international faculty, study abroad opportunities, FIIB’s programs are underpinned by the global/international theme universally. How FIIB’s PGDM is better than other B-schools? Sustainability Sensitization, which includes curriculum covering social, environmental and economic issues; Live projects in related organizations and In-house centre of excellence focusing on industry based research. Leadership Orientation, which includes leadership speaker series i.e. discussions with business leaders; we have students clubs and committees for various leadership programs. Professional Outlook Program, which includes case study methods, seminars, workshops, team projects, industrial projects and internships, early exploration of professional goals, interests and strengths. Global Mind set, which focuses on global markets and trends; joint classes with international partners like Sam Walton College of Business (USA), INPAQT (Netherlands) etc. ; study abroad and faculty exchange programs. The institute revises and upgrades its employability focused curriculum regularly, to incorporate the ever-changing needs of the industry and business, and this is what makes it different from other institutes. How does your institute help in personality development of the students? Forum for Industry Interaction, which provides a common meeting point for exchange of useful information by members of a business community. Public Speaking Forum, providing a unique communication and leadership platform to students to develop their public speaking and presentation skills. Study Abroad Program, focusing on helping students to experience dynamic global environment and get industry exposure in a global context. Corporate Internship Projects, designed to focus on getting hands-on experience of routine functioning of an organization, analysing currents practices and practical exposure to enhance their overall personality. FIIB Student Clubs channelize creative energies of the students in various areas like finance, marketing, dramatics, sports etc. Sankalp is an employability fest to expose students to the competitive corporate world through management games, competitions and simulation exercises. FIIB Leadership Program is a unique blend of academic, leadership and career development opportunities offered to select students. All these and many more activities help in overall development of a student’s personality. Can you provide the list of Alumni? FIIB alumni is a strong connected network of 2200 + successful MBAs spread across the world, at leading organizations, with major leadership roles. Some of our alumni include Mr Yogendra Goyal- VP Sales for WNS USA and Canada, Mr Pritiman Sarkar, VP Concentrix, Mr. Sandeep Biswal - Associate Vice President, HSBC Bank Ltd, Ms. Shweta Chandra and Mr Upendra Rai– AVP, at Yes Bank, Mr. Jyoti Pal – Asst. Director, ASSOCHAM, Mr. Anuj Kaura- Manager, FedEx, and several entrepreneurs who are doing extremely well in their ventures. For example- Mr Sandeep Sandhu who owns Texporto, a multi dollar firm based out of Brazil and Singapore. If you wish to check the complete list please login to our website www.fiib.edu.in. What is difference between PGDM and MBA and PGDM is better than MBA? The full form of PGDM is Post Graduate Diploma in Management, drawing attention to the fact that it is a Diploma course and not a Degree. The main reason why this is so is because autonomous (not affiliated to any University) Institutes (like FIIB) conducting management courses cannot offer MBA degrees. 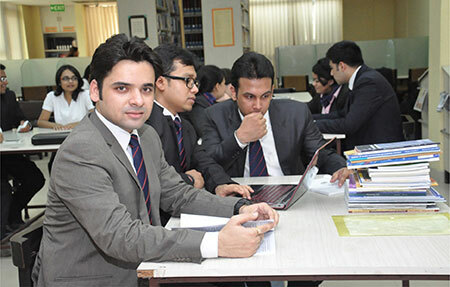 Over 90% of the top 100-B-School in India (like the IIMs) offers PGDMs. All IIMs and XLRIs offer PGP Diplomas or PGDMs (and not MBA degrees), since they are autonomous and hence, independent bodies. Having autonomy empowers the institute to design their own curriculum instead of following outdated University syllabi. This is important given that the needs of the industry are constantly changing, making up-dation an important pre-requisite for a relevant and useful course. Regular seminars, guest lectures, and industry visits help make students industry ready in two years. Corporate immersion exercises and an emphasis on a strong alumni and recruiter relationship make the PGDM far more relevant than an MBA degree. They also aid in enhancing recruitment from the industry and generally providing a better connect with the world of work. The ability to attract better faculty from corporate houses and provide better technological and study infrastructure to students also gives this course an edge. Hence, one can say that PGDM courses are more relevant as compared to MBA courses. 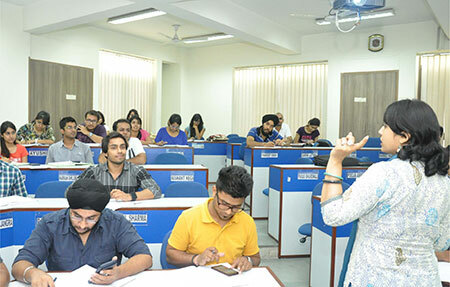 An AIU (Association of Indian Universities) accreditation to the PGDM institution equates the course with the MBA on university designed academic parameters, tilting the scales in favour of PGDM, given the practical advantages. Why did FIIB shift from IB to general PGDM? As per our research we found that many MNC's, IT and middle size companies are demanding other specializations as well. Also to increase the placements we are diversified FIIB into other specializations, though IB is our most sought but not the only one. We have designed so as to allow students to either specialize in 2 areas or major in one area and take courses from other areas as per their interest. FIIB Alumni specializing in IB are currently working at MNC’s such as Schlumberger, FedEx, DHL, Safe Express, etc. What are FIIB's latest ranking? How about foreign study trip? Is it compulsory? The FIIB MBA includes a compulsory Study Abroad trip to some strategic business destinations such as Finland, China, Singapore, Dubai, etc. A Study Abroad trip has many advantages and is integral to a program so deeply rooted in international and global experiences as FIIB. Through these trips our students explore the economic, business, political, and cultural environment and trends in their host countries. May I see the campus? You are most welcome! As a prospective student we encourage you to explore our program, campus and student life. Guided tours and presentations are held every Friday between 10 – 12 PM during the months of Oct-April. During this time, we will try and arrange for you to attend lectures, interact with students and faculty. Please call our Admission team to book you a spot. For direction to campus: If coming from IIT, take the outer ring road but do not go on the Rao Tula Ram Marg flyover. After crossing Vasant Vihar and the Hanuman Mandir, take left at the FIEO building. We are the second building from the corner. If coming from Gurgaon, take the Vasant Vihar exit from the highway. Make a U turn under the Rao Tula Ram Marg flyover. After crossing Vasant Vihar and the Hanuman Mandir, take left at the FIEO building. We are the second building from the corner. Is there any reservation for OBC/SC/ST/Physically challenged candidates? As such there is no reservation for any section of the candidates. However for achieving the goal of social inclusion and diversity, the candidates from SC/ST/Minorities and physically challenged categories are given some additional weightage in calculation of the merit score. What is the early round of Interview? My CET results are yet to be out and how is it helpful to the candidates? Consistency and good past academic performance. Relevant work experience (if any) that brings value to the class room learning. What is social immersion program? The FIIB Social Immersion Program (SIP) is a professional development program offering a unique blend of academic, social leadership and career development opportunities specifically designed to guide students towards lifelong professional success. Today, the world is witnessing an increased emphasis on social leadership that demands that all organizations – For-Profit, Not-for-Profit, the government and associated entities- learn to work more authentically to create more ‘purposeful’ enterprises that not benefit the enterprise itself but individuals and society at large. What is Guided Independent Study? Guided Independent Study (GIS) is an elective, self-directed course for majors and non-majors in a specialization domain, who wish to investigate a specific topic or creative project in the specialization. It provided the students with the opportunity to carry out research-oriented work one-to-one with a faculty mentor acting as Study Mentor. GIS is a scheduled PGDM course, arranged, planned and managed by a faculty mentor in conjunction with the goals that are proposed by the student. How is Business Simulation help full to students? Business Simulation is a practical, integrative business course that requires teams of students to operate a simulated business. Acting as a business manager, students set the direction for the company to build up the business by making decisions related to its Strategy, Finance, Market, Operations, HR and Innovation. It aims to foster interdisciplinary decision-making in an inexact environment and to prepare students for the problems and issues of working in a changing and uncertain world. What are the Grading Schemes, assessment components and weightage system? FIIB follows a grading system on a 10 point scale ranging from A+, A, A-, B+, B, B-, C+, C, C-, D and F Every course outline defines the assessment components and weightage assigned to it. Accordingly, the course faculty assign marks for every assessment component bringing it up to a total of 100 for a full course and 50 for a half-course. The highest package last year was 15.25 Lacs for the position of Marketing Executive with the Buoy Group and the Average package was 5.8 Lacs and minimum was 3.5 Lacs per annum. What were the main companies visited per specialization? Marketing area offered jobs in consumer durables, FMCG, sales , e-commerce, marketing research and advertising. The recruiters who are associated with FIIB over number of years are Redington, Colgate Palmolive, Berger Paints India Limited, Infoedge (Naukri.com), Godrej & Boyce, Asian Paints, Zomato Media Pvt Ltd, Videocon, Wrig Nanosystems, Matrix Cellular, Oxylane-Decathlon, Daffodil Software, Jaro Education, CITI Bank, ICICI Securities, Axis Bank among others. Finance area receive job opportunities from financial research and consulting, Banks and financial services. Of late, we have observed an increasing trend in financial research and consulting opportunities. Onicra Credit Rating, Deloitte, S&P, Capital IQ, Copal amba, Xl Dynamics, CSC, VIP Industries, Crisil, Ameriprise Financials, ICICI Bank, BlackRock are our regular recruiters. Operations and IB area receive profiles related to supply chain management and logistics. Companies who visit us on a regular basis are Dish TV India Limited, Kuehne-Nagel, Safexpress, Flourish Pure Foods Ltd, LloydVentures and many more. Human Resources area include generic, recruitment and HR research. Companies which have shown affiliation with us over the years for their requirements are Strategic Resources, Asahi India Ltd, Mirus Solutions, Stellar Search and Selection Pvt. Ltd, Moody’s Shared Services India, The New Digital, Synergy Consultants, KNR Management, Corporate Associates, etc. A few companies offering opportunities in Strategy and General Management area are Grofers, Gupshup Technology, WCRC. List in this area got extended with the entry of new companies mentioned as Printland.In, HLL Limited, MGH Group, Triplived Technologies Pvt Ltd., Aditya Birla Money, Gap International Sourcing. What are the various modes of transport? 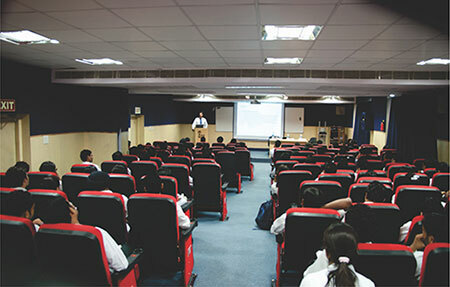 The FIIB campus located in the prime area of South-Delhi and very well connected by local bus services as well as close to two Delhi Metro Rail Services (Vasant Vihar & Moti Bagh Metro Station). What is the Admission Policies and procedures?